Claims: "True Instant Color. One stroke, full coverage application. This next generation lipstick gives the ultimate in color, texture and finish. The lightweight creamy formula contains Vitamins A, C, & E to moisturize and nourish lips"
This line from Milani has been out for a while now and is very popular this summer. These lipsticks come in a beautiful light gold tube with the shade color, name & number on the bottom. They have a variety of colors and finishes that would fit any person and their style. The colors range from neutrals to bold pinks, reds & purples. The colors goes on very pigmented with just one swipe. 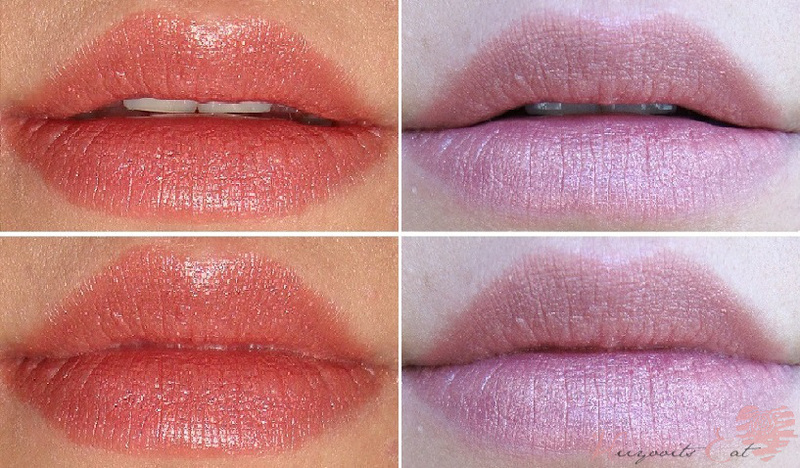 Due to the different finishes in the lipsticks some are creamier and more pigmented than others. I recommend using a lip-liner and lip brush for the more bolder colors or else they will bleed upon application. They aren't the most moisturizing lipsticks but they are hydrating enough. They also stay on for quite a while and leave a nice stain after it fades. The lip swatches have quite a difference between the flash and natural light but I have to say that the swatches with the flash are more accurate with how it looks in person. I am sure some of you guys already own some of the shades from the color statement line, which ones do you own? Any color you recommend? Gorgeous lipsticks, I love them all.